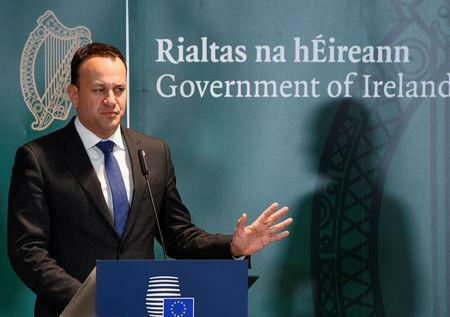 BRUSSELS (Reuters) - Irish Prime Minister Leo Varadkar issued a tongue-in-cheek reminder on Friday that European Union and non-EU countries - which neighbouring Britain is due to become - can share land borders without needing border patrol infrastructure and customs checks. 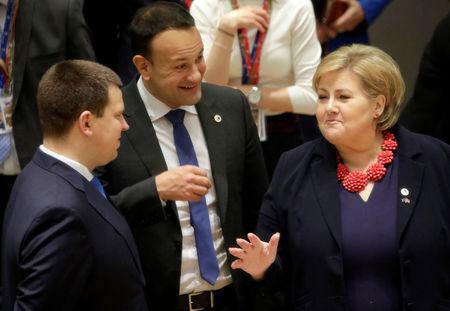 Varadkar tweeted from Brussels on the 25th anniversary of the European Economic Area that he had enjoyed meeting his counterparts from EEA members Norway, Iceland and Liechtenstein, who participate in the EU's single market without being members. "Good to meet up with the Norwegian, Icelandic and Liechtenstein PMs. All in the single market for 25 years but not in the EU," he wrote. "Sensible solutions are possible once red lines don't restrict them," he added, as he joined a drone-shot aerial photo of EU and EEA leaders in the European Council's cavernous atrium. Ireland, the only country that shares a land border with Britain, fears that allowing the return of border infrastructure between the British province of Northern Ireland and the Republic of Ireland could rekindle the violence over the province's status that marked much of the 20th century. But British Prime Minister Theresa May's self-declared red line that free movement between Britain and the European Union must end has become the biggest sticking point in talks over Britain's exit from the EU. It has led to the development of the customs union "backstop" that has triggered the ire of so many of her parliamentarians. Asked if Britain should join the EEA, Iceland's Prime Minister Katrin Jakobsdottir acknowledged this, saying: "I don't know if our circumstances are fitting for the UK. "We are members of the four freedoms: freedom of people, movement, services and all that, so I don't know if that is the right solution for the UK," she added. Her Norwegian counterpart Erna Solberg declined to discuss May's conundrum but praised the benefits to Norway of the freedom of movement that May opposes. "For a long time for Norway, freedom of movement was a benefit, because in a period where we had economic growth when others had a slowdown ... we benefited from the influx of labour so that our economy wasn't overheated," she said.